At A1 Sewer & Drain Services, we’re local sewer service experts with years of professional experience working with residential, commercial, and municipal wastewater pipes. 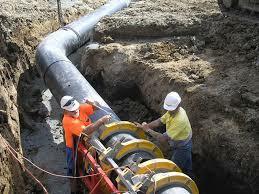 We provide sewer welding services, sewer pipe fabrication, and new sewer line installation in NJ. call us any time at A1 Sewer & Drain Services, at 201-645-0888. 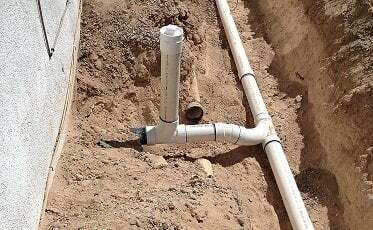 Every building needs a sewer lateral that connects drainage pipes from bathrooms, kitchens, and other amenities to the municipal sewer system. 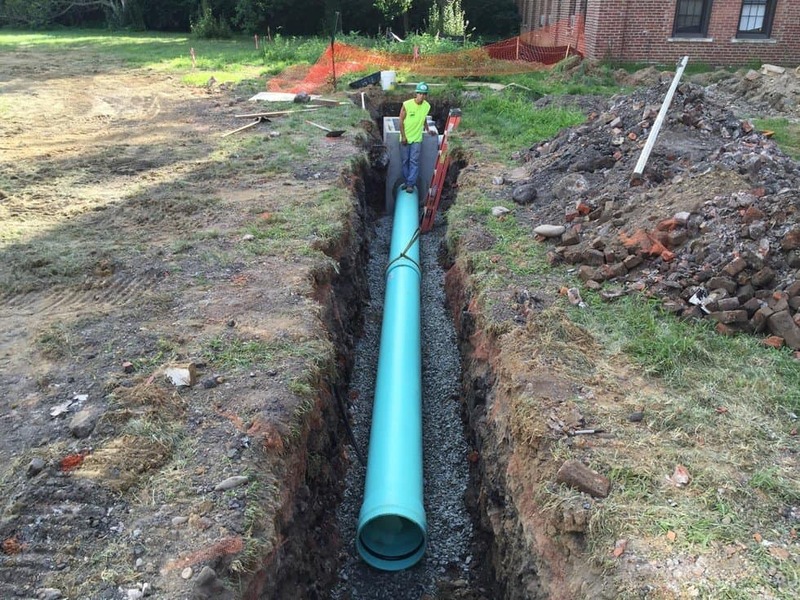 New homes and new commercial buildings will require sewer pipe installation and sewer fabrication from experienced local sewer service contractors in NJ. 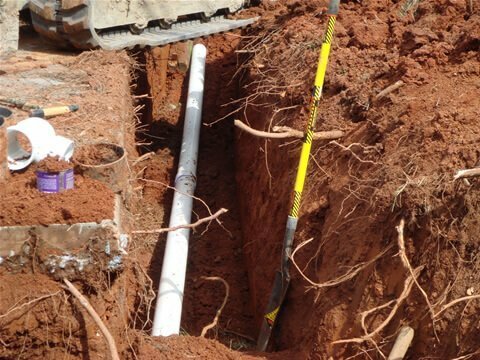 Sewer line installation can be a relatively complicated process, requiring careful measurements and extensive excavation to ensure the best possible results. When you’re installing a new sewer pipe, it’s important to choose the right material. There are several options for sewer pipe materials that are widely used today. The cost, durability, and service life can differ between different materials. These factors, along with local soil conditions and climate, can affect which material is the best fit for a particular property. Ductile iron pipe is a type of cast iron that’s designed so that it can deform slightly without cracking, increasing its durability and resistance to damage. This type of sewer pipe is quite heavy, but very strong and durable. There are existing cast iron pipes that are a century old, attesting the the material’s impressive durability. Cast iron pipe has a high pressure resistance, making it suitable for water mains as well as wastewater pipes. PVC plastic is lightweight and corrosion-resistant, yet rigid and very strong. It’s economical and easy to work with, making it a popular choice for many residential and commercial applications. It’s ideal for sewer pipe installation because unlike most metals, it’s resistant to bacterially generated sulfuric acid corrosion. The drawback is that after 50 years, it will lose up to 80% of its strength, and will need to be replaced. This service life expectancy is shorter than cast iron or copper. Vitrified clay pipes Vitrified clay is strong but heavy, and resistant to most forms of corrosion. 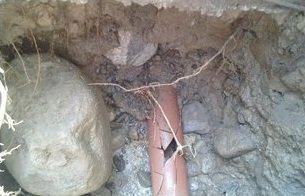 Interestingly, the mortar used in pipe joints will often degrade long before the clay pipe itself. Experienced sewer service contractors can help you decide which material would be best for your new sewer pipe installation. 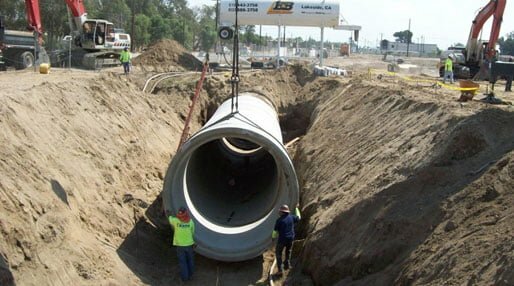 Sewer installation in NJ often requires some degree of sewer pipe fabrication. For PVC, a popular choice for wastewater pipes, sewer welding is achieved using special solvent cement that joints plastic components together into a single piece. The solvents cause the plastic to soften and swell. After the solvents have evaporated, the pipe is joined together. Resin can be used to fill in any existing holes in the pipe. 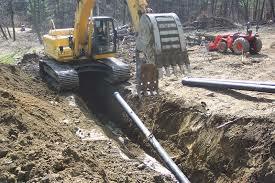 Sewer line installation in NJ will almost inevitably require sewer excavation. This process can be labor-intensive, but there’s really no other way to get a brand new pipe into the ground– although trenchless pipe bursting can sometimes be used to replace or upsize an existing sewer pipe. When excavating a trench for a new sewer lateral, contractors must ensure that the overall drop per foot doesn’t exceed 1/4″. This ensures that liquids and solids flow at the same rate, preventing the solids from backing up and clogging the pipe. This is calculated using careful measurements. The process does require heavy machinery to remove the soil and then backfill the trench after laying the pipe, and can take days to complete. Once the line is in place, however, a new sewer pipe won’t need to be replaced for decades. 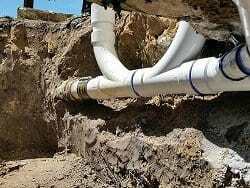 At A1 Sewer & Drain Services, our team of expert local plumbers are always available for a free consultation regarding new sewer installation or sewer line replacement in NJ. 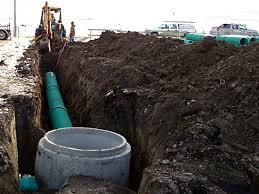 Need sewer replacement or sewer pipe installation in NJ? Call us any time to talk to a local contractor and get a 100% free cost estimate for your project, at 201-645-0888.